Santos Mahogany - Shipped directly to you. DESCRIPTION Santos Mahogany exhibits a range of color between light orange/brown with yellowish overtones to a dark reddish/purplish brown. This lumber actually a bit harder than Honduran Mahogany. This wood also features an interlocked grain, which gives it a strong ribbon-like pattern. MECHANICAL PROPERTIES This wood can be moderately difficult to machine, as would be expected from its density and its interlocked grain. Sharp tools and fresh sandpaper are necessary for finishing premium surfaces. WORKING PROPERTIES This lumber is moderately difficult to work with but can be finished smoothly with a high natural polish. Because of the density, all nails and screws must use pre-drilled holes. SEASONING The lumber typically will be dried at the sawmill, rather than shipped green and dried in the United States. Even with this wood being so heavy, it reportedly dries without much difficulty. USES Fine furniture, cabinets, interior millwork, hardwood flooring, entry doors, stairs and moldings. 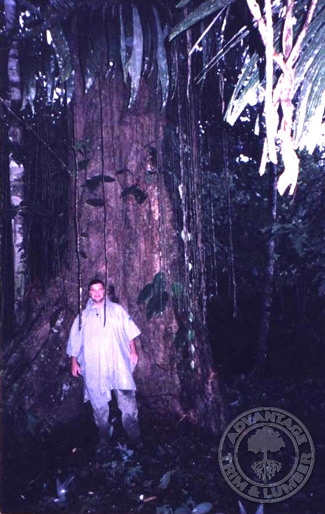 Above: Picture of owner Rob Pelc next to a typical Mahogany Tree. We go direct to the forest to make sure that our lumber is procured in a environmentally responsible manner.